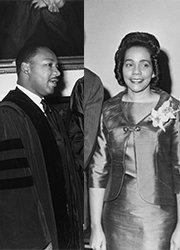 Visits to Yale by Martin Luther King Jr (1959 & 1964) & Coretta Scott King (1969) are documented in Manuscripts & Archives, and are part of a new banner exhibit in the nave of Sterling Memorial Library, on view until March 3. Dr. King was invited to Yale in 1959 by an undergraduate lecture committee and spoke on “The Future of Integration.” He returned to Yale in 1964 to receive an honorary degree, along with Averell Harriman, Philip Jessup, Sargent Shriver Jr, Alfred Lunt, and Lynn Fontanne. Dr. King was released on bail from the St. Augustine, Florida jail, just two days before receiving the degree from Yale. He had been arrested for ordering food in a whites-only motel. Dr. King’s honorary degree caused considerable reaction, both pro and con, around the country. Coretta Scott King was named the first Frances Blanshard Fellow at Yale in 1969. While on campus she met with women graduate students and spoke to a standing room only crowd in Woolsey Hall on the importance of campus unrest in addressing social injustices. The materials in this exhibition are reproductions of records from the Office of the President, Kingman Brewster (RU 11); Office of Public Affairs and Communications, Yale Events and Activities Photographs (RU 690); Buildings and Grounds Photographs (RU 703), the Helen Hadley Hall Fellowship Program (RU 9), and YaleNews.